PT Kimia Farma Apotek - PT KFA or known as Kimia Farma Apotek is a reputable pharmaceutical company in Indonesia with core business competencies in pharmaceutical retail and healthcare services. The Company was formed in 2003 and is a member of state-owned pharmaceutical giant PT Kimia Farma (Persero) Tbk. As of December 2017, Kimia Farma Group holds 99.99% shares in Kimia Farma Apotek. Other 0.01% remaining shares in Kimia Farma Apotek was owned by Yayasan Kesejahteraan Keluarga Kimia Farma (YKKKF). According to information found in Kimia Farma Apotek's website as cited by JobsCDC.com, PT Kimia Farma Apotek is recognized as the leader in pharmaceutical retail business in Indonesia with the number of 1,000 pharmacies, 500 health clinics, and 10 optics as at the end of December 2017. The Company also supported by 47 clinical laboratories which operated by its subsidiary PT Kimia Farma Diagnostika. Male or Female, maximum age of 23 years old. Minimum D3 degree in Pharmaceutical. JobsCDC.com now available on android device. Download now on Google Play here. Please be aware of recruitment fraud. The entire stage of this selection process is free of charge. 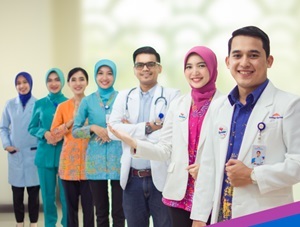 PT Kimia Farma Apotek - Fresh Graduate Pharmacist Assistant Kimia Farma Group November 2018 will never ask for fees or upfront payments for any purposes during the recruitment process such as transportation and accommodation.